Sibling rivalry rears its ugly head in every household. Prevention is the key to managing sibling conflict. Learn to look for triggers and have clear consequences set up for your kids. We've included some helpful tips for prevention and conflict resolution. Check them out and get a hold of sibling rivalry before it gets a hold of you!! 1. Teach your kids healthy communication and coping skills during everyday routines. Teaching your kids to use "I statements" is productive. For example, your child might say to a sibling, "When you call me names I feel angry," instead of merely yelling or striking out during a conflict. Positive communication skills will come in handy with friends, teachers, parents, and other people in your child's life. 2. Have clear consequences set up. For example, name calling might be 10 minutes off television time or hitting is a time-out. In addition, use a behavior chart to structure positive rewards. Have some incentives set up for acceptable behavior. 3. Be a good role model for your children. Resolve your own conflicts in healthy ways. Yelling and fighting with a spouse or family member may cause children to model that behavior. 4. Avoid comparing your children. This will only set the stage for future rivalry. 5. Be aware of patterns in your children's behavior. Is there a time of day when conflicts often arise? Is there a consistent cause of conflict? For example, do your kids have a fight every day over which television shows to watch? Pay close attention to your children's behavior and intervene before a problem arises. Help your kids develop resolutions before they are in the heat of a battle. 6. Nurture your children's relationships with each other and give them positive feedback. As always, catch them being good. When your kids are getting along, let them know you appreciate their positive behavior. 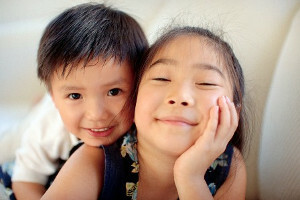 Check out our "Caught You" Reward Coupons specifically for siblings!